This is an 18th century watermill set over a stream, with a 19th century top course. It may stand on the site of an earlier mill dating from 1454. The adjacent miller's house is also 18th century with an additional 19th century top storey. The mill may have been a paper mill for some time. The mill was used in the 1996 BBC adaptation of George Eliot's 'The Mill on the Floss'. Miller's House has southeast gable of chequered brickwork with Georgian doorcase - wall probably early to mid 18th century. Top course 19th century. Showing roof raised when dormers added. Otherwise two bay two storey façade. Mill building itself of later date (contemporary with house roof?) - early 19th century, red brick, four storeys, three bays to southwest; but only two columns of windows to northeast. Corner cut away where road curves round. Set over stream. Windows have rounded heads (except top storey). Dentilled cornice. Bridge in front seems older, but perhaps only because brickwork has been cemented over. Stone block like a cross shaft, but probably only a corner-guard. Still in use. And mentioned in 1454 (at least one assumes this from its inclusion on his map of 'North Elmham in 1454' in (S2), although the only reference in the text is a mention in 1636). May once have functioned as papermill (S3). See (S4) on history of mill, which states that its lower two stories are 18th century, only the top floor being 19th century. The article also says that the 1454 mill must, on topographical grounds, have been somewhere in the area, but that the present site is of totally 18th century creation when the mill leat was cut. E. Rose (NAU), 7 July 1987. (S5) and (S6) in file. The mill building has fossil gable tumblehomes faintly visible in the end wall beneath whitewash, confirming that the upper storey is an addition. There is a huge crack at the left hand front corner. --- Aerial Photograph: TF9924 D-G,H-P.
--- Newspaper Article: Eastern Daily Press. 1986. Bintry Mill - picture. 7 June. --- Newspaper Article: Eastern Daily Press. 1997. Mill seen by millions.. 29 May. --- Newspaper Article: Eastern Daily Press. 1996. 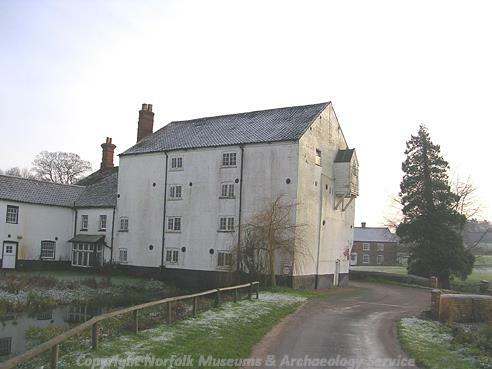 'Star Role' Bintry Mill will become 'Mill on the Floss' - picture.. 28 August..
<S2> Serial: Yaxley, D.. East Anglian Archaeology. East Anglian Archaeology. Vol IX, pt II. <S3> Article in serial: Stoker, D. 1976. The Early History of Paper-making in Norfolk. Norfolk Archaeology. Vol XXXVI Pt III pp 241-252. p 251. <S4> Publication: June 1987. Period Home. <S5> Graphic material: Various. Various. Architectural plans..
<S6> Photograph: I & RS. Digital finds image.